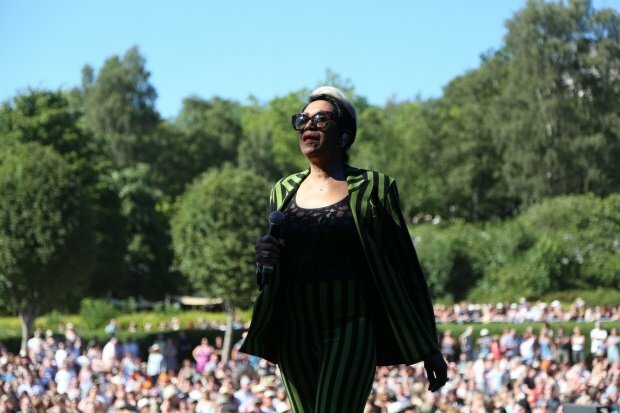 For the past few years, the West End Festival has hosted a series of concerts on the Kelvingrove Bandstand, cornering the market on heritage disco, funk, hip hop and soul acts. For 2018, the bandstand was abandoned in favour of a full blown music festival experience with an expanded capacity and more renowned marquee names on the bill. Unfortunately, this may have been too ambitious, as the first day of the festival was riddled with lengthy drink queues, sound problems and a lack of catering options for the 10,000 capacity event. Despite these issues, the acts throughout the day appeared determined to show why they deserve their place in popular music history. The festival was also blessed with some unseasonably good weather, with temperatures reaching 26 degrees in the hottest part of the day. 'The godfather of neo soul' Roy Ayers (★★★☆☆) took to the stage in the early afternoon as the audience were still filing in the gates. His loose jazz-funk is perhaps not best suited to this type of large stage and early time slot, and the audience's attention was certainly wavering at the middle of the set but nonetheless the septuagenarian performer proved a charming stage presence and his entire band seemed to be enjoying themselves. By the time it came for an extended version of 'Everybody Loves the Sunshine', enough of a crowd had gathered that it was easier to get lost in the performance and the closing stretch of songs delivered a welcome start to the day. Craig Charles (★★★☆☆) immediately took to the stage next, with the 6 Music presenter's branded DJ equipment brought out the second Ayers and his band left the stage, keeping energy levels up. For those familiar with Charles' radio programme (and touring DJ slots), this was a standard set but the man's undeniable enthusiasm (particularly for Stevie Wonder) and willingness to play the hits kept the audience pleased, with a surprisingly large crowd dancing as much to his performance as any of the live acts that followed. The Pointer Sisters (★★★★☆) were next and were the first to show obvious signs of technical troubles at the start of their set, although these were quickly ironed out as the show went on. Although the current line up contains only one original sister, Ruth, the remaining members are her daughter Issa and granddaughter Sadako, and the charming family dynamic is maintained. They unleashed a bevy of hits, including 'I'm So Excited', 'Jump' and a cover of Aretha Franklin's 'Chain of Fools', with elegance and synchronised dancing to match. 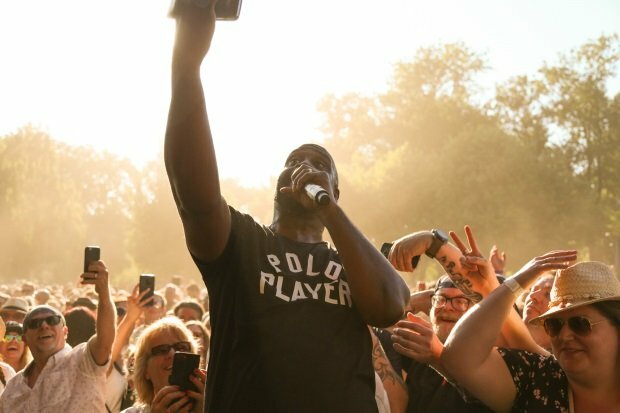 After a short break, the charming hip hop trio De La Soul (★★★★☆) took to the stage. Foregoing any live band or set dressing, the three took control of the large stage through sheer force of personality with constant crowd interaction (including the charmingly hackneyed trick of pitting one side against the other) and proved their place on the bill, despite their own claims of not being worthy. A compact one hour set that barely paused for breath, save for a stage invasion from Nile Rodgers, the MCs lovingly traded bars and won over an audience who may not have been entirely familiar with their catalogue outside the obvious hits. 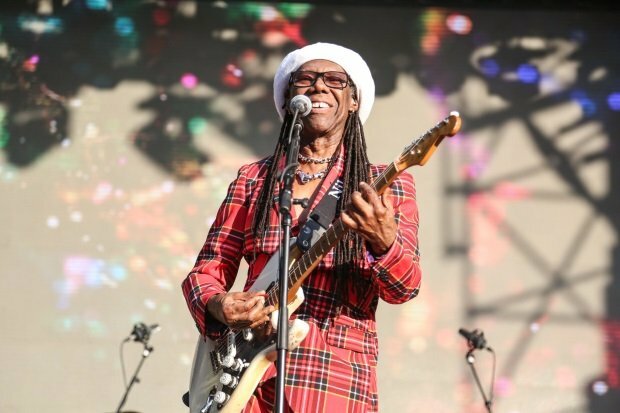 Next up was Chic ft. Nile Rodgers (★★★★☆), puzzlingly not headlining the night despite being the top name on the Sunday line up. Suffering the most from the day's sound issues, with vocals constantly being too quiet, the huge band faced a slightly uphill battle despite the goodwill from the crowd. In the end, they were able to pull through and put on an energising set that has been honed to perfection over the years, drawing from a startling amount of hits plucked from both Chic's best known disco classics to songs Rodgers has been involved in; such as Bowie's 'Let's Dance' and Daft Punk's 'Get Lucky'. Capping the main event off were Earth, Wind & Fire (★★★☆☆), who perhaps managed to outdo Chic in regards to band members onstage. Known for their lively shows, the group were clearly at home on the large festival stage, and kept the audience on their feet with a lively set. An early cover of The Beatles 'Got To Get You Into My Life' was questionable, as was a mid section string of lesser-known songs, but the inevitable run of 'Boogie Wonderland', 'Let's Groove' and 'September' ended the show on a particularly high note. For those who were looking to continue the dance party, SWG3 boasted an enviable line up headlined by Candi Staton (★★★★☆) who performed an impressive midnight set with a full band in the venue's Galvanizers space. It was strange to have her relegated to the after party, and although she and her band put on a great show peppered with hits (including a fantastic 'Hallelujah Anyway' encore), it perhaps would have been suited better to a slot in the main line up. Fiesta x Fold had a lot going for it; offering a great alternative to the indie heavy TRNSMT, it is encouraging that there is demand for simultaneous music events of this size in Glasgow, and the layout of the site showed that a fairly large scale music festival can be held in Kelvingrove Park, but more thought needs to be put into how to manage audiences of this size if it is to return next summer.